Hello all!! 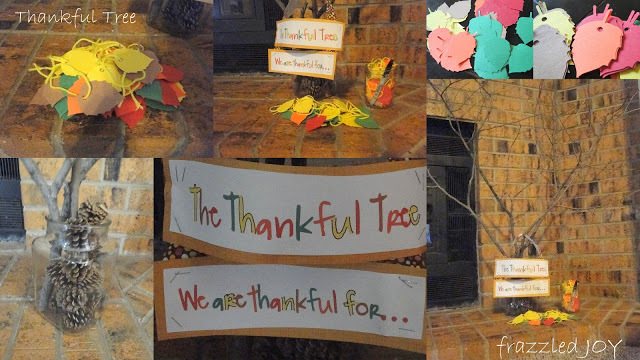 Last year when I found pinterest I found these cute trees – “thankful trees”. I loved the look and the idea so I duplicated it. 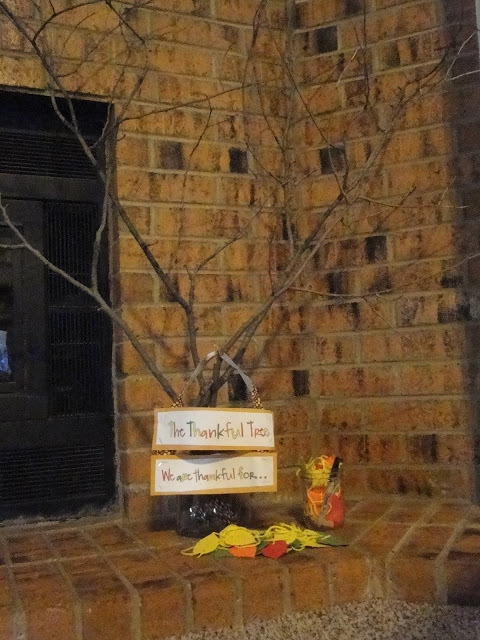 And this week our “Thankful Tree” went up again. Counting my blessings is one of my favorite activities. Truly I have soooo many things to be thankful for. I know sometimes I get caught up in the aggravation of day to day living and I forget to take a moment and remember all the things in my life I have to be thankful for. God has brought my husband and I on incredible path over the past 18 years of marriage with many twists and turns and bumps. Sometimes (when we have a quiet moment just the two of us) we like to walk backwards through the path and connect the dots. 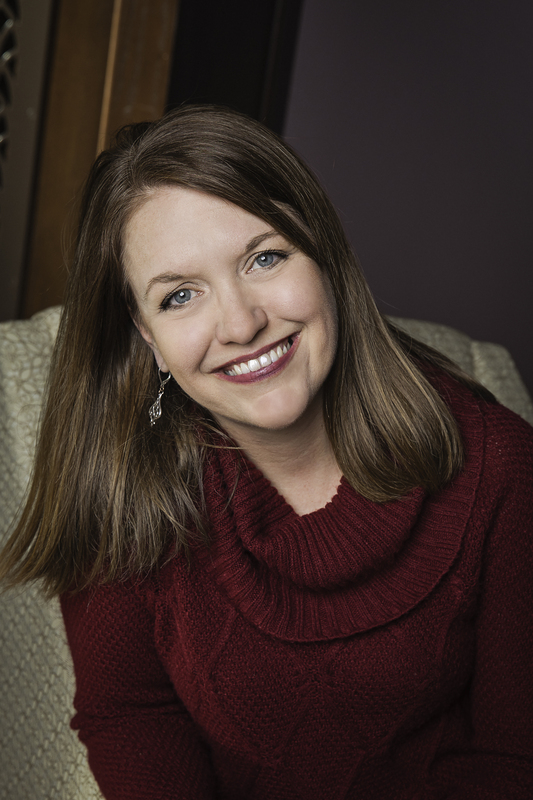 When you are in the midst of the mess it doesn’t make sense and we wonder “what in the world?” But, when you are through it, and on the other side of it you can look back and make that connection. Those “oh, I get it now” moments are my favorite. God is amazing and He always knows what’s coming next, and next, and next. Back-tracking and putting the pieces together helps me to remember that. It’s an awesome peaceful feeling to know that no matter what He is on the throne and in control. God has been really pricking my heart lately and stirring me to do more for the unloved. I’m still praying and working through how all that is going to look exactly but I will most likely be sharing a little bit here. Mostly I am just convicted that it is not someone else’s responsibility to take care of these people, but as a follower of Christ it is mine. I know I am only one person, but added to another one person, and another. Well, you get the picture. 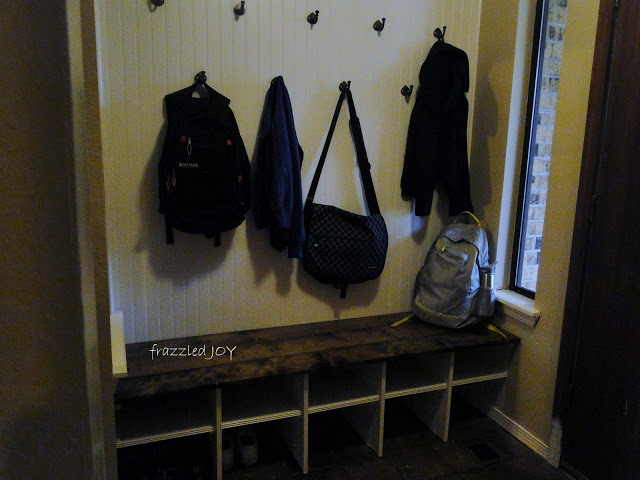 By the way, I snapped this shot of my entryway/mudroom this morning before the kids left for school. Here it is in action!! Loving it!! Praying that you take a moment to count your blessings, back-track over your life and put the pieces together to see God’s hand. Try it, you will be amazed. I liked the idea and look and had the perfect place for it. 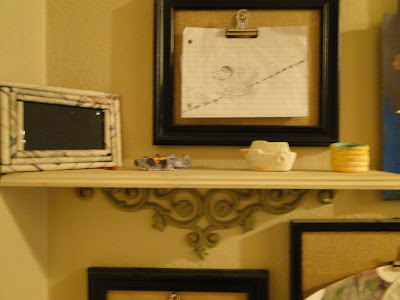 See, there is this awkward little piece of wall in the corner of our L-shaped hallway that is in between the bedrooms. It’s too big to leave blank but I could never figure out what to put there. This worked out perfectly. I used some old frames I had in my closet that I was no longer using, I painted some blue and left some black, I removed the glass in the frames to make room. 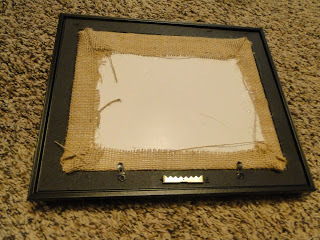 Then I took some foam core board I also had left-over from a previous project and covered it burlap using hot glue to secure it. 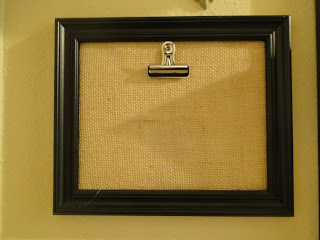 Then I bought these really cool clips and attached those to the burlap piece with hot glue. 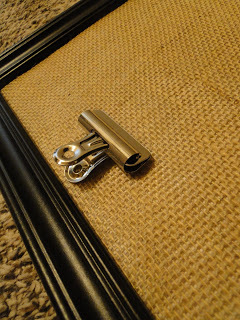 TIP: put the burlap piece in the frame before mounting the clip so you can make sure you have it in the right place. 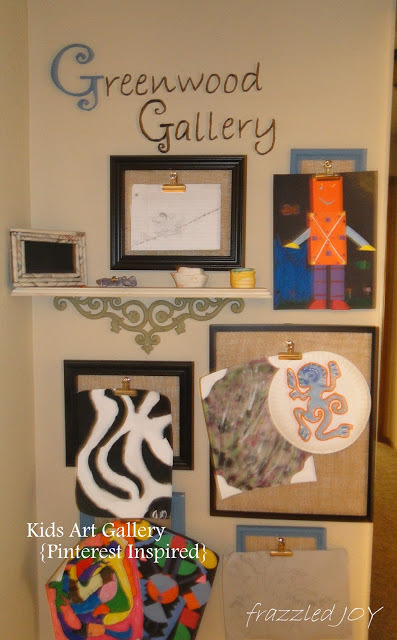 I had a shelf that I was no longer using and decided to incorporate that as well for those lovely pottery items and 3-D art. 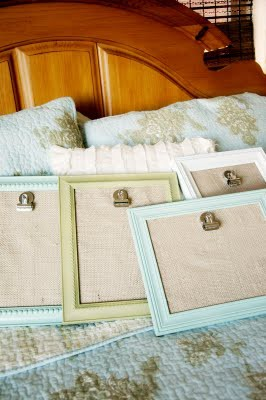 I was going to paint the bottom to match the frames, but I thought the color blended enough that I decided not to. 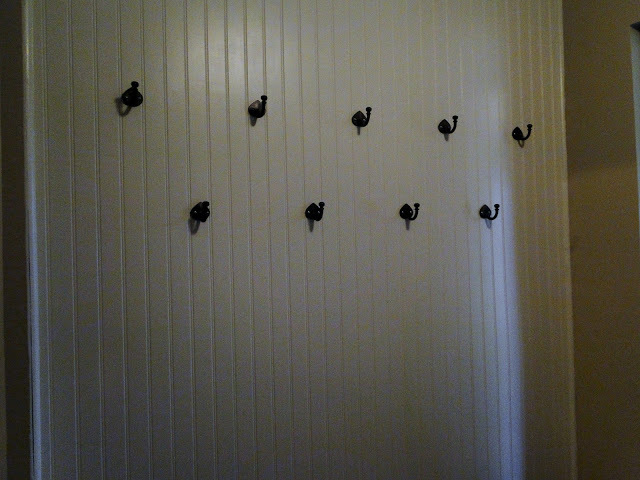 I decided I wanted to give this wall a title of sorts. 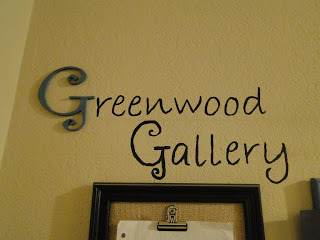 Hence the cleverness at the top “Greenwood Gallery.” 🙂 I bought a cute scrolly wooden G from HL and painted it to match the blue frames and then painted the rest right on the wall. 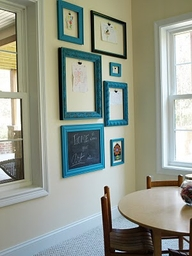 I printed the words from my computer and then transferred them to the wall by rubbing pencil on the back of the paper and then “tracing” over the letters on the front – by pressing hard while tracing the pencil that you colored on the back will come off on the wall. It wasn’t a perfect science but it was good enough for me!! 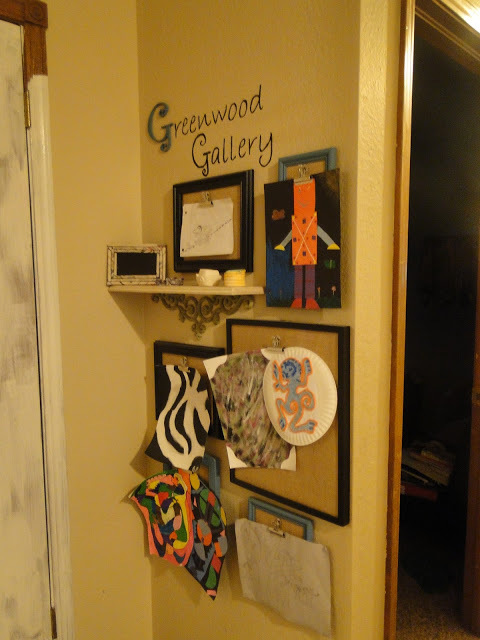 My kids couldn’t wait to choose their artwork to fill it up and we all love having it on display. A hidden bonus is it keeps people from piling junk up in this corner!! 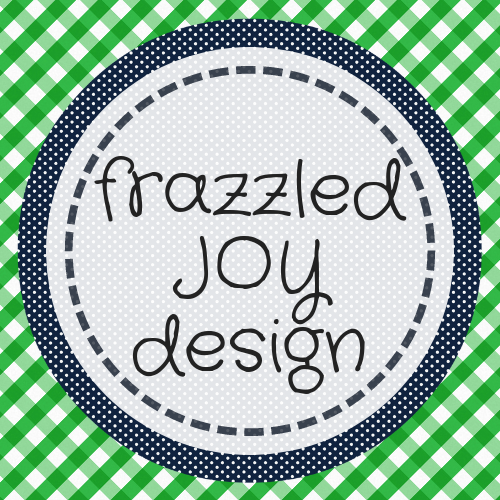 Go and check out many more projects and get yourself inspired!! 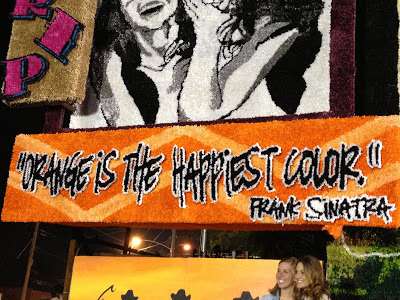 Sooo excited to share with you the finished product…a few days later than I hoped, but hey it’s done!! (It feels so good to say that) Here it is in all it’s glory..
It’s exactly how I imagined it!! Surprisingly it makes the space feel bigger! 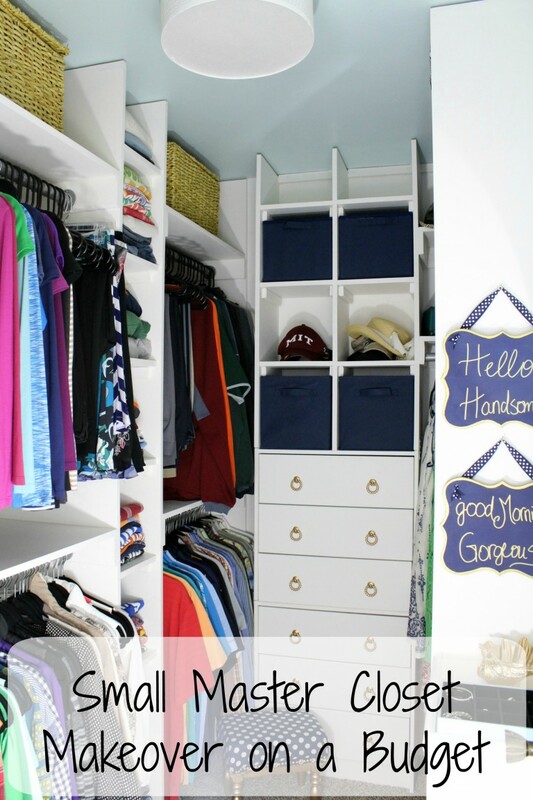 I am still on the hunt for baskets to put in the cubbies to hold hats and gloves and scarves, but I am okay with not having them yet, I know I will find something. Thanks for those who stayed with me through the process. 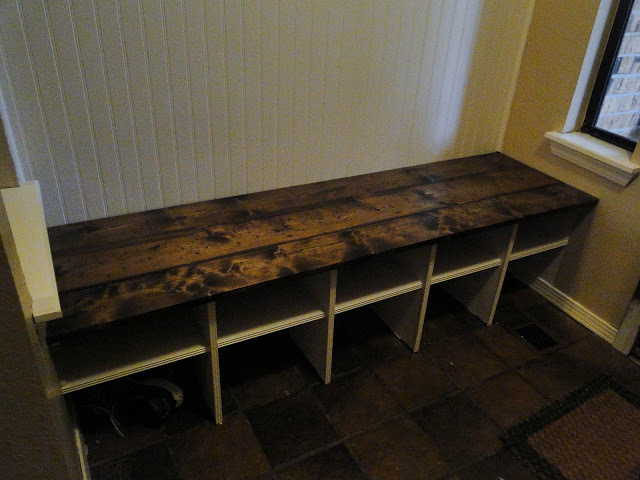 This build cost around $125 to complete, baskets not included of course, and around 10 – 12 hours total for two amateur carpenters. Not bad I think. If you want to see more of the process you can check here. This project had been on my home improvement project list for a long time, but the fluff stuff always took precedent. 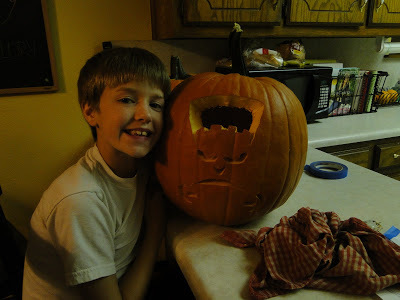 But, as of late the things that will make our home function better for our family have been bumped to the top. We have lived here 11 years and our kids are bigger, and so is their stuff. We are working on getting rid of unnecessary stuff and making our spaces more organized and efficient -all the while looking pretty 🙂 …or at least that is the goal. I want to be able to come home and feel relaxed, I want that for the whole family. 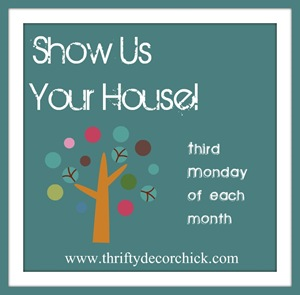 I no longer want to be controlled by my stuff – always having to pick up, clean, dust, move, stuff. I want my stuff to work for me. Anybody else feeling that way? So, now I am turning on some music and cleaning house. I don’t know about the rest of you but when I get into a project, everything else gets forgotten. HA!! So, until next time!! 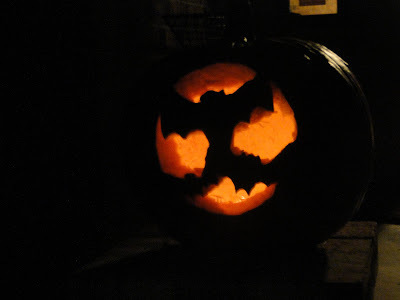 Blessings to you and thanks for reading!! 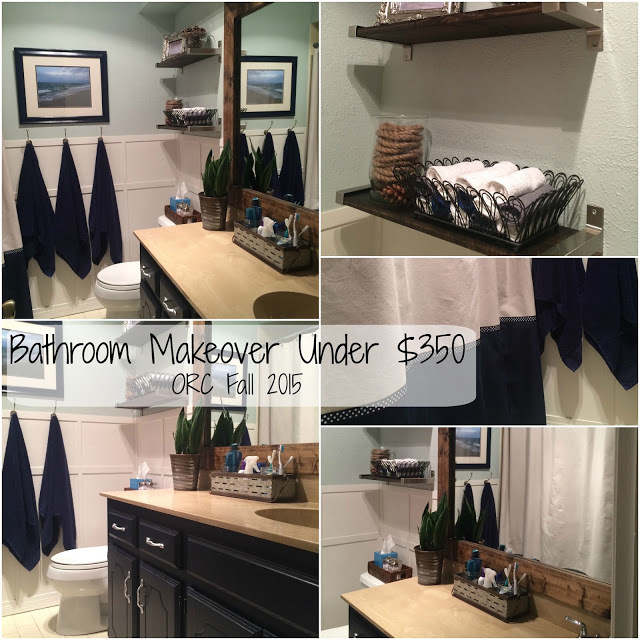 Well, if you were hoping to see the finished product of our entryway project you will have to check back in a couple of days. 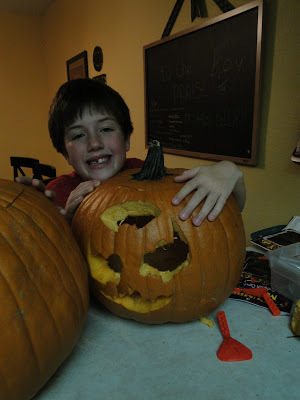 Because we are amateur DIYer’s we of course had a hiccup that delayed things a bit, and then of course life and family fun took precedent over finishing :). 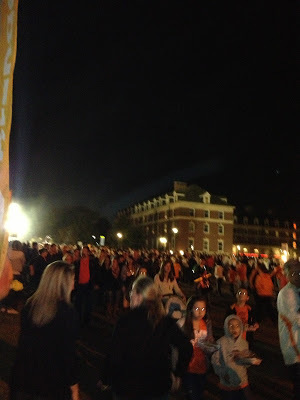 It is a sea of orange everywhere you look!! LOVE!! 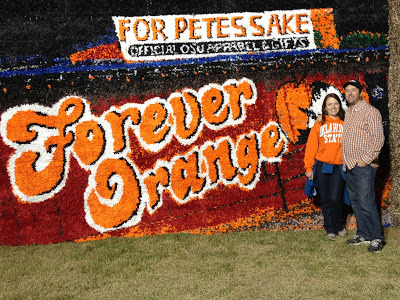 You see we’re not crazy, my husband and I both graduated from OSU and we have raised all our kids to love OSU and yes orange!! 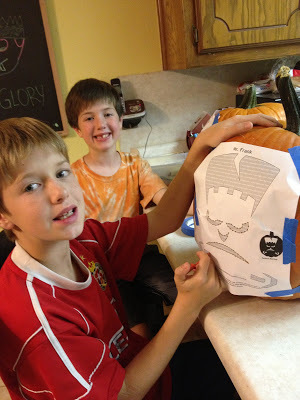 We spent Saturday watching the game, carving pumpkins, and recovering from our Friday night fun. 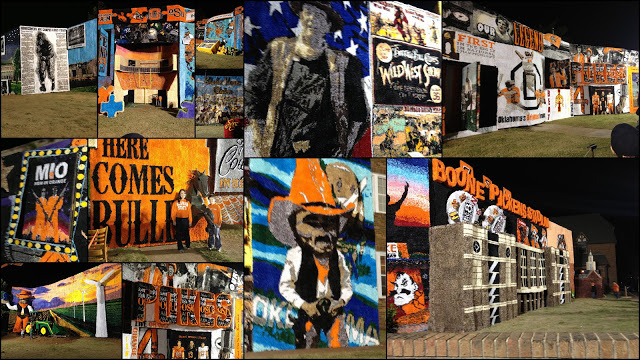 Here is the finished products all lit up. I leave you with a collage of pics from the walk around. 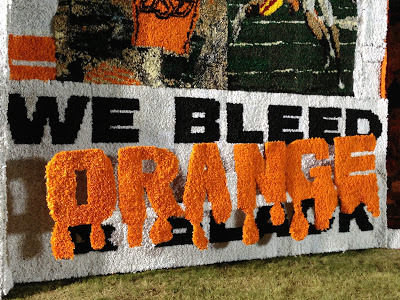 It’s amazing what they can create with chicken wire and tissue paper. We started with supplies. 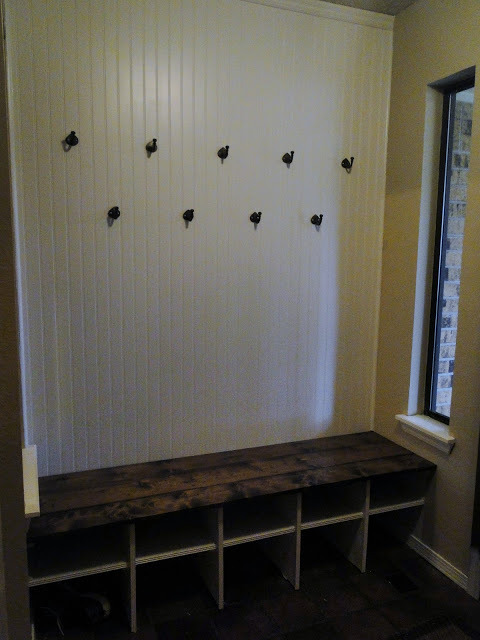 Bead board paneling for the wall, 1×2 for the shelf and bench supports, and 1×6 for the bench slats. We had some of the boards cut for us at HD because we just aren’t that accurate with the saw and some of the cuts needed to be done well. But…most of them we saved for ourselves because I’m a visual person and even though I had a plan, I just wasn’t 100% sure how it was all going to come together. 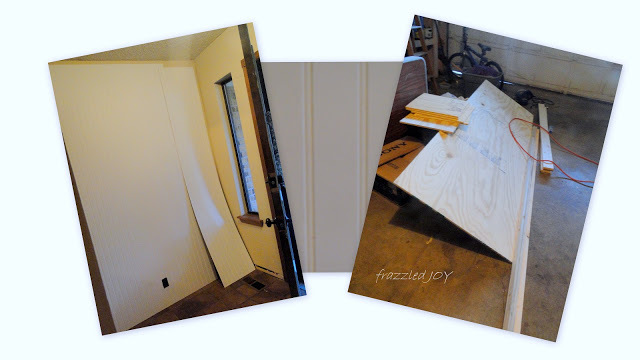 I grouped the pictures of the process in collages so as to not flood you with pictures. I got most of my methods from the internet or I made them up as I went along :). I wanted this to be pretty and looked like it belonged in my house, but I also needed it to function. 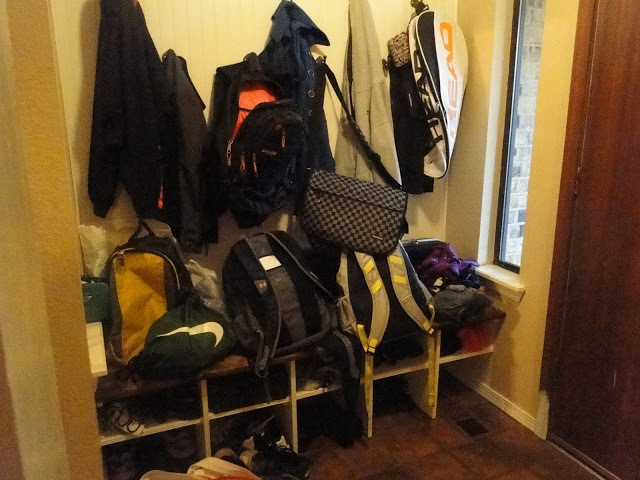 As I showed you here, our entryway usually looks like a dumping ground. My hope is that if I give them somewhere pretty to dump put there stuff then it won’t be all over the floor – we shall see. 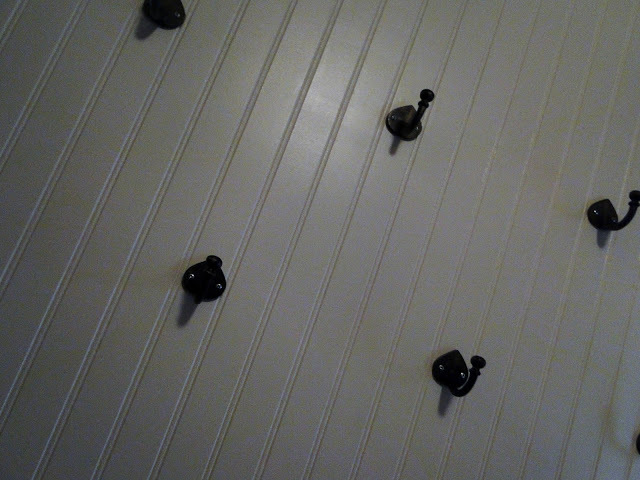 I bought some stock molding at HD to cover the cut edges of the plywood and attached them with wood glue and some tiny finishing nails. I caulked EVERYTHING. Caulk is my best friend, it covers all the mis-measuring, mis-cutting, and wonky wall problems. 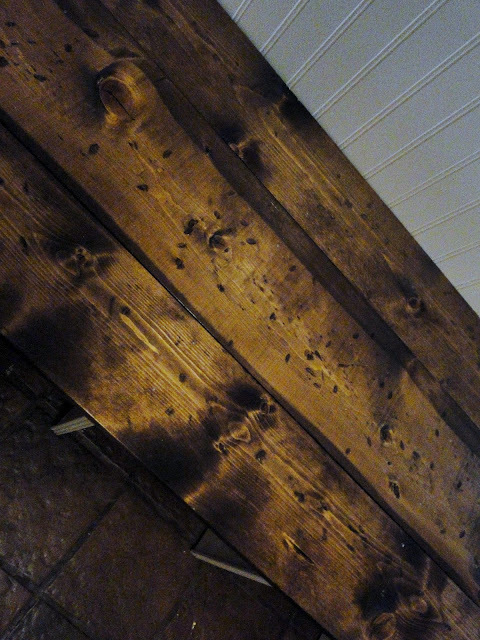 And, once you paint over it no one will ever know (shhhh…). 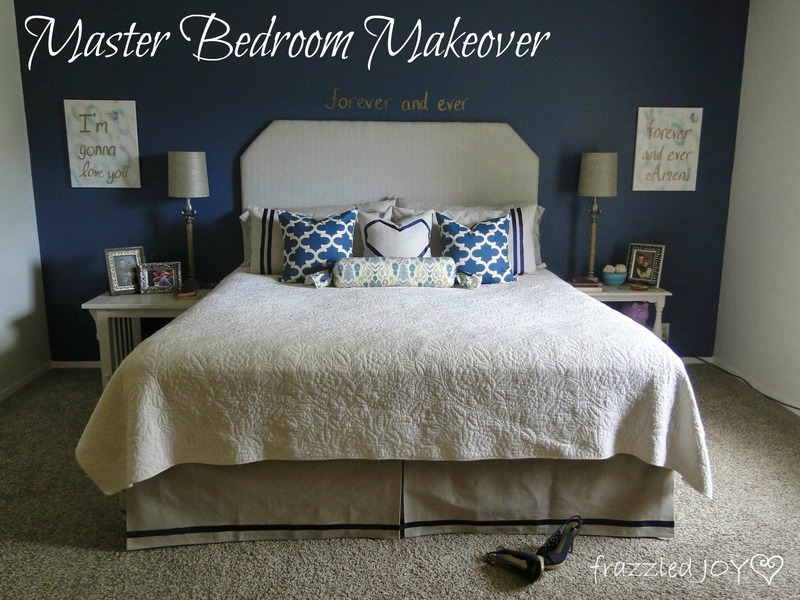 I decided to go with a dark stain rather than the faux treatment from my inspiration photo here. I put hammers and chains in the hands of my 9 and 11yr. old and allowed them to go to town on these boards. They loved it!! 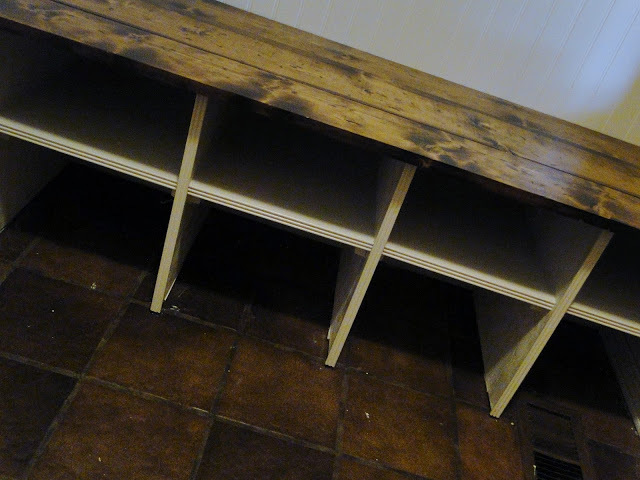 We bought soft white wood that would distress and stain well. 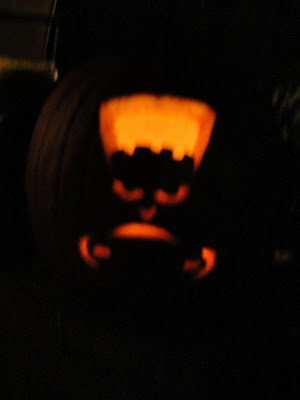 I wasn’t worried about knots or variations because I like the character. 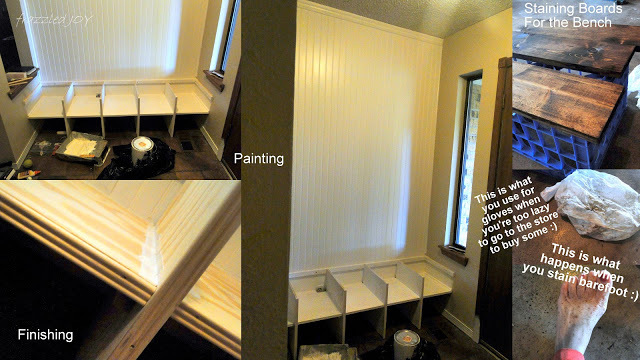 I’m hoping to get the finishing touches – poly, touch-up paint – done and then install the bench boards. 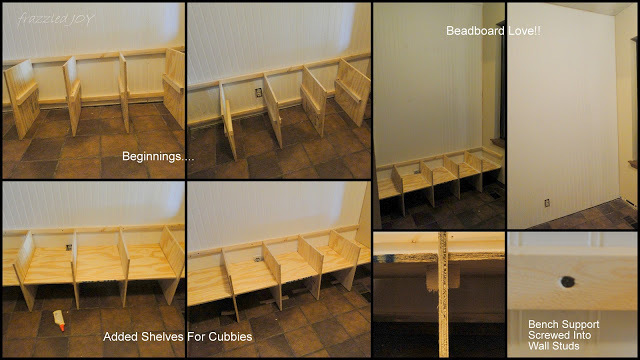 I shopped for hooks today and worked on number and placement of those, next is baskets for the cubbies.